OAKLAND, March 10. — Oakland now has a bit of street ornamentation with a flavor of old Italy in the new Cleveland street cascades, recently completed under plans by Landscape Engineer Howard Gilkey. Cleveland street, from Lakeshore avenue one block to the east, was too steep to be traversed by any vehicular traffic and the street was ordered closed and turned into a park. It occurred to Gilkey that the declivity offered an excellent opportunity for a cascade similar to those in Italy, which have been copied in the private grounds of a few rich Americans. 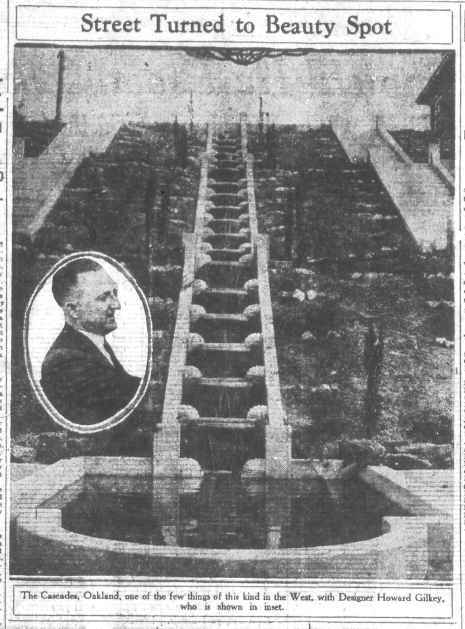 There was no such cascade in any public park in this part of California, and Gilkey worked out a plan which followed the old Italian idea but embodies many new and original features. The water flows down over twenty concrete bowls, illuminated at night with vari-colored lights, and ends in a tank at the bottom. Here an electrically driven pump is in operation, returning the water to the higher lever (sic) so that it may fall again over the bowls and past the colored lights. The grounds on either side are being developed with shrubs and the two level landings will be made beautiful with a tile paving now being worked out by Gilkey. “It will take two or three years for the beauty of the plan to be apparent to the casual eye,” said Gilkey. “Just now it appears rough, as the shrubs are not grown sufficiently to hide the ground. In time, however, this should be one of the beauty spots of the city. The water is turned on each afternoon and the lights are in operation on Saturday and Sunday evenings. The cascades are on Lakeshore avenue, along which thousands of automobiles pass in their journey around the lake.